In God’s providential guiding, Calvary Chapel Boise has been led to go to a unique and yet needy place. With the first European outreach in 1996, Italy has been a place where God opened many doors of ministry. 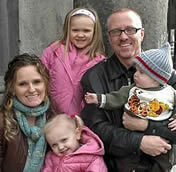 Then in the summer of 1999, Brent and Hope Harrell moved to Rome to share God’s love and word with Italians and others. Since then, a small body of believers has developed with a heart to mature and be a witness in Rome. God has provided a meeting place within walking distance of one of the largest Italian universities with approximately 100,000 students. The chapel is located relatively close to the downtown business districts as well as the main train terminal which receives most local transit, and national and international travelers. A great harvest awaits! The Lord himself said that the harvest is plentiful but the laborers are few. After much prayer, the opportunity has come for committed servants to join the work in Rome. ~ Editorial by Calvary Chapel Boise. From the very time of my conversion I was sold out to whatever God might want for me. He saved me in great ways and His love and grace impacted me forever. By His grace, I wanted all people to know this same love, freedom, goodness, etc. of the Lord and have the hope that comes from knowing Him. As I began to share and serve in the body, the Lord made it clear that I would be a part of leadership in His church. He granted me love and passion for His Word, and then gave me a heart to teach, serve, bless, and care for His people. After serving in our home church for years in various capacities, God called us to plant a Bible teaching church in Rome. We were asked to do a simple interview for an online publication called Calvary News Network which is done by a christian journalist in Denmark.